A new model of the universe? It starts out with the familiar concept of the "multiverse," which is mainly associated with the many-universes interpretation of quantum theory. According to one verbalization of the multiversal interpretation of quantum theory, every time a quantum-random "choice" is made (say, an electron spins up instead of down), there is a "branching" into two possible universes: one where the electron spins up, another where it spins down. Similarly, if a bus drives at you while you're walking across the street, there may be two possible universes ahead of you: one where you get flattened, and another where you don't. (Actually, there are a lot of other choices going on in your life too, so it's more accurate to say there is one set of universes where you get flattened and another where you don't). The collection of all these possible universes is known as the "multiverse." In fact the language of "choice" used in the above description of the multiverse is a bit suspect. It's more accurate to say that corresponding to each possible state of the electron (up/down) once it is coupled with the external environment (so that it decoheres), there is a set of branches of the multiverse, and leave the ambiguous and misleading language of "choice" out of it. Anyway, the multiverse is fascinating enough, but it's just the beginning. It's easy enough to think of multiple possible multiverses. 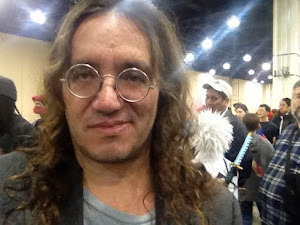 After all, there could be a multiverse in which Ben Goertzel never existed at all, in any of its branches. One way to think about backwards time travel, for instance, is as a mechanism for selecting between multiverses. If you go back in time and change something, then you're effectively departing your original multiverse and entering a new one. So, we can think about a multi-multiverse, i.e. a collection of multiverses, with a certain probability distribution over them. I don't posit this hypothesis all that seriously, but I'm going to throw it out there anyway: It seems possible to conceive of consciousness as a faculty that facilitates movement between multiverses! Well, I guess you can see where all this is going. If there's a multi-multiverse, there can also be a multi-multi-multiverse. And so on. Two Yverses may have two kinds of relationship: sibling (two branches of the same parent Yverse) or parent-child. Backwards time travel may jolt you from one Yverse to a parent Yverse. Ordinary quantum decoherence events merely correspond to differences between sibling Yverses. What use is the Yverse model? I'm not really sure. It seems to be an interesting way to think about things, though. If I had more time for pure intellectual entertainment, I'd put some effort into developing a variant of quantum theory based on Yverses and infinite-order probabilities. It seems a notion worth exploring, especially given work by Saul Youssef and others showing that the laws of quantum theory emerge fairly naturally from the laws of probability theory, with a few extra assumptions (for instance, in Youssef's work, the assumption that probabilities are complex rather than real numbers). And reading Damien Broderick's excellent book on psi, "Outside the Gates of Science," got me thinking a bit about what kinds of models of the universe might be useful for explaining psi phenomena. Yes, quantum theory is in principle generally compatible with psi, so one doesn't need wacky ideas like Yverses to cope with psi, but it's fun to speculate. It seems to me that for quantum theory to account for psi phenomena would require some really far-out long-range quantum-coherence to exist in the universe, which doesn't seem to be there. So in my view it's at least sensible to speculate about how post-quantum physics might account for psi more sensibly. This babbling about psi leads back to my wacko speculation above that consciousness could be associated with action in the multi-multiverse. In the Yverse model, the idea becomes that consciousness could be associated with action in the parent Yverse. Could the difference between physical action and mental action be that the former has to do with movement between sibling Yverses, whereas the latter has to do with movement between parent and child Yverses? -- (semi-relevant, rambling) P.S. Those who are interested in my AI work may be interested to know that I don't consider any of these funky speculations contradictory to the idea of creating AI on digital computers. The whole connection between probability, complex probability, quantum theory, determinism and complexity fascinates me -- and I consider it extremely poorly understood. For example, I find the whole notion of "determinism" in very complex systems suspect ... in what sense is a digital computer program determinate relative to me, if I lack the computational capability to understand its state or predict what it will do? If I lack the computational capability to understand some thing X, then relative to my own world-view, should X be modeled according to complex rather than real probabilities, in the vein of Yousseffian quantum probability theory? I suspect so. But I won't pursue this any more here -- I'll leave it for a later blog post. Suffice to say, for now, that I have a feeling that our vocabulary for describing complex systems, with words like "determinate" and "random", is woefully inaccurate and doesn't express the really relevant distinctions. In September 2007 I went on a two week business/science trip to China (Wuhan and Beijing) and Japan (Tokyo). In between some very interesting and productive meetings, I had a bit of free time, and so among other things I wound up formally submitting a prayer to the Japanese gods for a rapid, beneficial technological Singularity. Let's hope they were listening! I wrote this blog post on the flight home but wasn't in a silly enough mood to post it till now. My trip started in Wuhan, where I gave two talks at an AI conference and visited with Hugo de Garis and his students (his apprentice "brain builders"). Their near-term goal is to use genetic algorithms running on field-programmable gate arrays to control a funky little robot. Wuhan was a fascinating slice of "old China", with folks sitting out on the streets cooking weird food in woks, strange old men looking like they lived in 500 BC, and everywhere people, people, people. Alas I forgot to take pictures during my walks through the streets there. Beijing by comparison was not too interesting -- too much like a modern Western city, but with terrible, yellow, reeking air. But the Great Wall, a bit north of Beijing, was really an amazing place. Too bad you aren't allowed to hike its full distance. I thought maybe the local gods would look more favorably on me if I ate some of the local cuisine, so I filled up on donkey, whole bullfrog, sea cucumber, duck's blood and pig foot fur and so forth. Not so bad as it sounds, but I still preferred the kung pao chicken. where I happened upon an intriguing site where Japanese go to submit prayers to the gods. Each prayer is written down on a little piece of wood (which you buy for five dollars), then placed on a special prayer rack with all the others. The gods then presumably sort through them all (maybe with secretarial help from demigods or some such -- I didn't ask for the details), and decide which ones are worth granting, based on whatever godly criteria they utilize. In the end, not wanting to be left out, I plunked down some yen to buy a little piece of wood and submitted my own prayer to the Japanese gods, to be considered along with the multitude of other human wants and needs. Hopefully the Japanese gods were in a generous mood that day -- for all our sakes! attracted so many comments (largely on various mailing lists I posted the blog URL to), that I figured I'd post a brief response here, expanding on some of the ideas in the responses and connecting them with some ideas from dynamical systems theory. The theme of "Becoming a Neuron" was how dependent we are, these days, on the global communication network and the emerging human group mind. The theme of "The Global Nincompoop Awakens" was how many of the communications between the "human neurons" comprising the global brain seem completely idiotic in nature. (Google or Wikipedia "adaptive stochastic resonance" for a load of technical papers on the topic, by Kosko and others). This picture shows nicely how, in the context of the human perceptual system, adding noise can help make patterns more perceptible. Now, Kosko verges on insinuating that this kind of exploitation of noise is somehow a NECESSARY property of intelligent systems, which I doubt. However, it seems plausible that he's right about its role in the human brain and human perception/cognition. Semi-relatedly, I recall reading somewhere that motion-sensing neurons in the brain are, on average, off by around 80 degrees in their assessment of the direction of motion of a percept at a certain point in the visual field. But we can still assess the direction of motion of an object fairly accurately, because our brains perform averaging, and the noisy data gets washed out in the average. In other words, brains contain a lot of noise, and they contain mechanisms for working around this fact (e.g. averaging) and creatively exploiting it (e.g. adaptive stochastic resonance). Now, it's not too surprising if the emerging Global Brain of humanity is more like a brain than like a well-engineered computer program. In other words: most of what goes on in the global brain, like most of what goes on in the human brain, is likely to be noise ... and there are likely to be mechanisms for both working around the noise, and exploiting it. This brings up the interesting question of what techniques may exist in sociological dynamics for exploiting noise. How might adaptive stochastic resonance, for example, play a role in sociodynamics? Could it be that the random noise of nincompoopic social interactions serve to make significant sociodynamic patterns stand out more clearly to our minds, thus actually enhancing the ability of the Global Brain to recognize patterns in itself? I wonder how one would make an experiment to demonstrate or refute this? It would of course be difficult due to the massive number of confounding factors in any social system, and the difficulty of defining things like pattern and noise in the social domain as precisely as is possible in a domain like image processing (where of course these terms are still susceptible to a variety of interpretations). And surely this simple idea -- obtained by extrapolating Kosko's image-processing example to the sociological domain -- is not the only possible way that social systems could profitably exploit their intrinsic noisiness.